Mrs. Shrividya S P, a student from science background, completed her MBA from CMR Center for Business studies in HR during the academic year 2011-13. 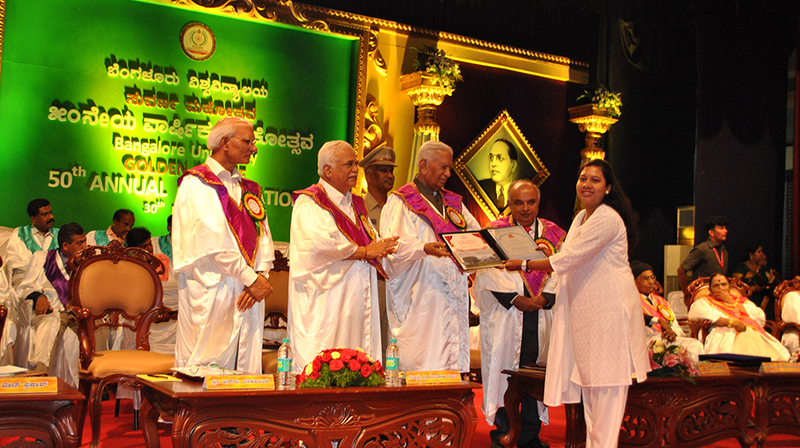 She received the Gold Medal in HR from His Excellency, the Governor of Karnataka, Shri Vajubhai Vala during the 50th Convocation annual celebration of Bangalore University. The function was a treat to the eyes of the spectators as the hall was filled only with Gold medalists of all UG and PG courses offered by Bangalore University including Ph.D. scholars who were awarded the degree on the same day. Mrs. Shrividya S P is currently working as an Assistant Professor in CMR Center for Business studies.